A few weeks ago, we posted about LiLi, a experimental hi-tech library vehicle from Canada. 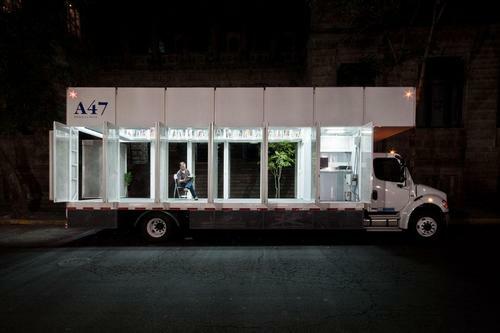 Today, meet A47, a mobile library in Mexico City that has taken a decidedly low-tech angle to reach out and deliver library services. 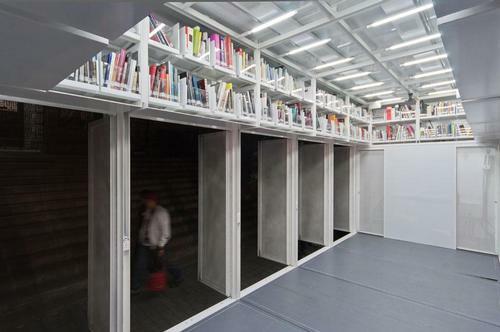 "The floor of the lorry comprises a series of mobile platforms giving access to the bookshelves, allowing the space to be re-arranged according to the different activities taking place. The micro perforated sheet surround acts as a permeable membrane that merges the outside and inside, making the space an exercise in honesty with its environment. From the street, one's view of the transparent intricacy that suspends the large solid volume allows a glimpse of the diverse range of titles inside, while also acting as an urban beacon through the night. This illumination — produced by the lorry's own integrated electricity generator — provides a reassuring glow when the streets fall dark, and announces the start of its nightly programme."